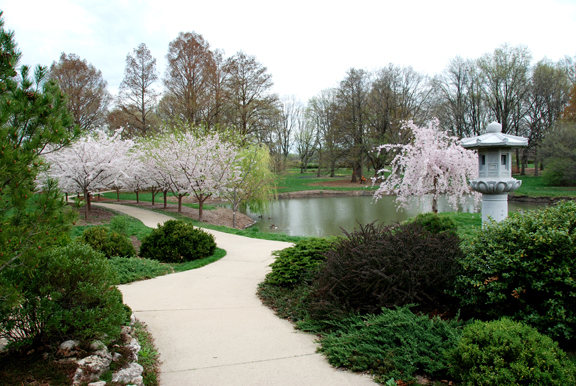 The Sen Cherry Tree Allée was made possible by gifts from Dr. Genshitsu Sen and Dr. and Mrs. Luting Liao in 2008. The cherry tree blossoms create a mesmerizing canopy that attracts visitors of all ages eager to welcome spring's arrival. The idea to add a variety of cherry trees to the Japan House landscape evolved during a garden tour and conversation between Dr. Sen and former Japan House director Kimiko Guni. Dr. Sen was a former grandmaster of one of Japan's san-Senke (three schools) of Japanese tea ceremony — the Urasenke Tradition of Chado. Dr. Sen sent master landscape gardener Katsuo Kubo to design the project and oversee the installation. Each tree was thoughtfully selected by Mr. Kubo and then carefully positioned in keeping with Japanese cultural believe that, like each human, each tree has a personality uniquely its own. The project was completed in the spring of 2008.